3 Kids, 2 Jobs, 1 Life: A Diva? You Think? I was out on my mom's deck yesterday with the kids as they were trying to decide if they wanted to swim anymore and I realized that because of the cloudy sky, that I had some decent light to take a few photos. (Decent light to take non-flash photos which would be so much better with a DSLR, but I digress....) Anyway, here are some of the shots I took of Caroline. I think they are pretty funny but I should tell you they are obviously all posed. I don't know why she won't give me one of her beautiful smiles in a picture anymore. When she sees me with a camera, she automatically does some kind of odd pose and makes a serious face. Sigh. She's still mooning over the teen idol magazine my MIL bought her a few weeks ago. She takes it with her everywhere and stares at her favorite stars. I don't think she needs any more of these rags until she's at least 14. 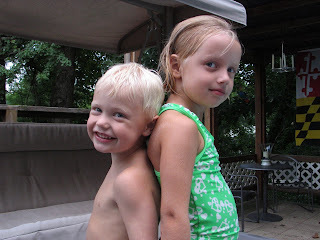 Back to back siblings....it took quite a bit of instruction to get them to stand like this. I didn't think it was that difficult of a concept, but apparently, it was.